Oklahoma City, OK — The entire month of June is filled with fun ranging from yoga classes to the beginning of SONIC Summer Movie Nights, our second Dancing in the Gardens, Full Moon Bike Ride & Run, outdoor dining to kids educational classes plus Weekly Walk-Ups returning to the Children’s Garden and more. Most events are absolutely free for Gardens members, and a Family Membership is just $65 per year for up to eight people. 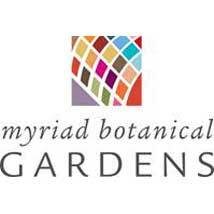 To see our full calendar, register for an event or become a member, visit www.myriadgardens.org. It wouldn’t be summertime in Oklahoma City without the Myriad Botanical Gardens presenting movies, dancing, full moon bicycle rides and runs and plenty for families to do during the day. SONIC Summer Movies, Weekly Walk-Ups, Dancing in the Gardens, Yoga, Full Moon Bike Rides & Runs, Outdoor Dinner Series & more! Look for the bare necessities in our Children’s Garden as we transform the area into a jungle haven. Experience Rudyard Kipling’s story of how the man cub, Mowgli, adapts to life in the jungle with the help of Baloo, Bagheera, Kaa, and those pesky monkeys. Enjoy crafts, activities and imaginative displays that capture India’s rich culture and will educate us all on the adventures in this heartwarming story. Presented by Nabholz Corporation. Join us at the Meinders Terrace for a sweet Sunday brunch in the Gardens. Chefs from Urban Agrarian will guide guests through their locally grown foods. After the passed appetizers, Urban Agrarian will treat us to a farm-to-table brunch made with fresh, local ingredients. Limited seating is available. Your favorite health and wellness activity is back! Join other runners in a 5K run, led by Ultramax Sports Oklahoma, through the scenic downtown area as the sun sets. Those who make their $5 donation will be entered in a drawing for prizes from Red Coyote Running and Fitness. Bring your bike and meet up a for a leisurely one hour ride. Downtown-area routes are specially planned by Schlegel Bicycles. Don’t have a bike? Rent a Spokie! Lights and helmets are required. This year’s Oklahoma Gardening School generated so much enthusiasm about prairie gardens that we decided to invite two of our speakers and local nursery owners back for a plant sale! We are pleased to have Bill Farris, owner of Prairie Wind Nursery in Norman, and Marilyn Stewart, owner of Wild Things Nursery in southeastern Oklahoma, setting up shop at our Pavilion for a special two-day sale with a special Members’ Preview sale Friday, May 27, 9-10am. Gardens members receive 10% off during the Friday early hour sale. Join us for our Myriad Gardens Walking Tour program! The tours, “Plants for Color” or “Plants for Water Conservation,” highlight plants in each season around the Gardens. Enjoy guided tours at 10am the last Saturday of each month or pick up a self-guided tour handout in our south lobby. Sorry, no groups please. Contact Lily Christman at (405) 445-5162 for group activities. · Make it Mondays: Each Monday children will “make and take” something home using a variety of natural and craft materials. We’ll make a summer full of fun garden crafts like wind chimes, chia heads, and seed bombs. · Tasty Tuesdays: Don’t miss this fun morning where you’ll get to play with food! Combine different shapes of fresh veggies, fruits, and herbs to create edible animals like cucumber bumble bees and cauliflower sheep! This activity is a great way to turn a “yuck” into a “yum” and to learn about foods and the plants they come from. · Reading Wednesdays: It’s that time of year when Bringing Books to Life moves back out into the garden! We’ll be reading nature–inspired books that connect children with what is growing and changing in the garden each week and then make a craft. · Think Green Thursdays: This day of the week is devoted to fun crafts that focus on the 3 R’s of environmental kindness: reduce, reuse, and recycle. We’ll upcycle unused or discarded items to make something new and cool like transforming a plastic bottle into a bird feeder! · Find It Fridays: This is a self–guided scavenger hunt, leading you on a discovery of nature in the Children’s Garden with all of its shapes, textures, and beautiful colors. Use fun tools like magnifying lenses, binoculars, or even special glasses that help you see like a bee! Late arrivals not accepted after 5:50 p.m. This is a great, all-levels class led by Lisa Woodward. Class participants should bring a yoga mat and water. Classes will meet under the Pavilion as weather permits; when it doesn’t they will meet inside the Crystal Bridge. Drop in for a session or two or enjoy the entire series! Join the fabulous instructors from 3Sixty Dance Studio for a small group dance lesson in preparation for Dancing in the Gardens. This one hour lesson will give participants one-on-one instruction and break down the steps to help get you prepared for a fun night of Swing dancing. Limited space available, please register by Monday, May 30. Dancing in the Gardens featuring Swing! Join us as we transform the Seasonal Plaza into an urban dance space. Beginning at 7 p.m., instructors from 3Sixty Dance Studio will give a dance demonstration followed by a FREE lesson for all. At 8pm on our DJ will crank it up! Join us for this entertaining, informative and edible class as we make (and then eat!) goofy portraits all out of fruits and veggies. Together we’ll read a couple books, learn interesting facts about fruits and veggies and why they’re good for us. We’ll then play with our food to make silly faces and enjoy our creations as a snack. Barre3 will takeover the Myriad Gardens for their amazing FREE community workout. This FREE class will be taught by barre3 experts. All you need is your yoga mat, water bottle and barre3 buddy. The next workouts are July 11 & August 1. Get in touch with your roots to create an Oklahoma Indian Blanket painting! Each participant will receive a 16” x 20” canvas to create a masterpiece that can be enjoyed for years to come. Join us at the Meinders Terrace for an intimate dinner under the stars and in the gardens. Chefs Kamala Gamble and Barbara Mock will guide guests through how to make their own appetizer from locally grown foods that they could grow in their own backyard. After the appetizer lesson, the Chefs will treat us to a farm-to-table dinner made with fresh, local ingredients from their Urban Farm, Guilford Gardens. Limited seating is available. Come celebrate Dad at the Myriad Gardens Father’s Day 5K and Fun Run. Run with your father or in honor of your father. Ultramax Sports Oklahoma will host and time the run. Awards will be given to the best Father/Son Duo, Father/Daughter Duo and the Biggest Support Group for your Father. All registrants will receive a finisher medal and a t-shirt. Refunds will not be given for this event. A much-loved summer tradition is back thanks to our sponsor SONIC, American’s Drive-In! Join us each Wednesday on the Great Lawn for movies, activities, food and lots of fun. Thanks to SONIC these movies are completely FREE. Come early to get a great seat. Bring a picnic or enjoy a hamburger and fries from the Ice House, hot dog from J’s Ice Cube or from our line-up of food trucks. Movie: The Little Rascals are back in an all-new movie! Join the fun with Spanky, Alfalfa, Darla, Buckwheat, Petey the dog and the whole gang as they are up to their usual mischief! The Rascals try anything to raise the money needed to save their grandma’s (Doris Roberts) bakery. The only trouble is – they can’t seem to do anything right! From botched pet washes to terrible taxi service, they just can’t raise a penny. Their only hope is to win prize money from the local talent show – but have you ever heard Alfalfa sing? In this class we’ll talk all about butterflies, not just how beautiful they are, but also how important and impressive their lives are. We’ll see butterflies up close, learn all about them with a fun game and make butterfly antennae and proboscis (that’s a butterflies tongue!) to wear home. Butterfly wings are encouraged. Did you know the monarch population has decreased by 90% in recent years? Artist Christie Hackler has long been fascinated by this creature and is focused on creative ways to turn the decline around. Join us and get the first glimpse into our conservatory at Christie’s captivating and beautiful exhibit. Pollinator-inspired food and drinks will be served and Christie will be around to discuss her works, her efforts to save the monarch, and to share a little about the smaller pieces we’ll have for sale during the exhibit. In this informative and fascinating workshop we’ll focus on why pollinators are so important and the little things you can do to help pollinators and their favorite plants thrive in Oklahoma. Come experience the magnificence of MUD and you’ll see why playing in the dirt is proven to make you happier, healthier, and even smarter. We’ll make mud pies, mud fairy houses, and so mud more! You can even roll in the mud if the spirit moves you. House of Clay will be on site for some “make and takes” like pinch pots, mud medallions, seed bombs, and snails for your fairy house! A rinsing area will be available, but remember to wear your play clothes and shoes—and kids, don’t forget to bring your swimsuit for the Thunder Fountain! Join us each Wednesday on the Great Lawn for movies, activities, food and lots of fun. Thanks to SONIC these movies are completely FREE. Come early to get a great seat. Bring a picnic or enjoy a hamburger and fries from the Ice House, hot dog from J’s Ice Cube or from our line-up of food trucks. Come in costume as your favorite Hotel Transylvania character and win a family night in Bricktown! Love’s in the air when Don Pedro’s army, drunk with victory from the war, descends upon Leonato’s country estate in Messina. Traveling with him is Claudio, who wants to marry Leonato’s daughter Hero. Meanwhile, Claudio’s friend Benedick and Leonato’s lively niece Beatrice hide their mutual attraction behind a volley of witty insults. But their world is shattered when Claudio, influenced by a scheming malcontent, levels a shocking accusation at Hero. A linguistically challenged guard and his sidekicks uncover the plot, casting a beam of hopefulness in this tempestuous landscape of love. FROM THEIR WEBSITE: deadCenter has become Oklahoma’s largest film festival and one of the “20 Coolest Film Festivals in the World” according to MovieMaker magazine. While still presenting the best of Oklahoma films, deadCenter has grown into an international festival, featuring over 1,500 films from around the world and all over the United States. Last year’s festival attracted 30,000 fans to downtown Oklahoma City. But, throughout the years, deadCenter has remained dedicated to providing our filmmakers and audiences with the best possible experience, with great films, interesting filmmaker panel discussion and amazing parties. All films and events take place in glorious downtown Oklahoma City. Films screen at Harkins Bricktown Cinemas, Oklahoma City Museum of Art, the Myriad Gardens Terrace Room, and outdoors at the Myriad Gardens Great Lawn.